What a game to bring you the latest MGL Voice Artists’ Spotlight feature gamers. 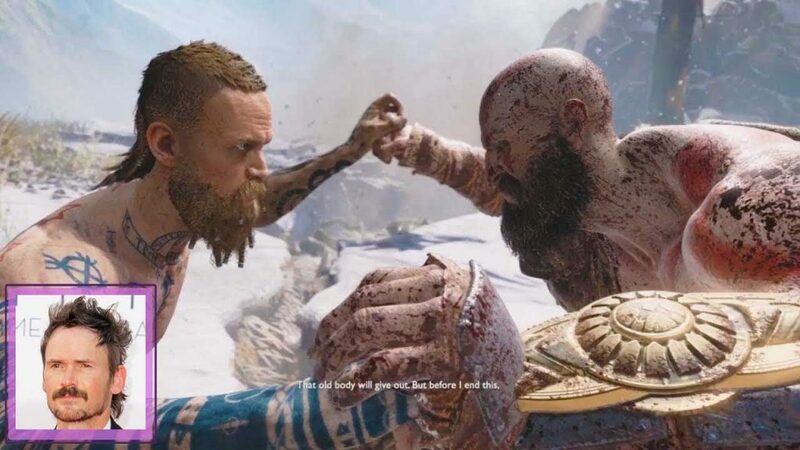 This time it’s Santa Monica Studio’s latest adventure with Kratos. A game already with rave reviews and has been very much enjoyed here by the MGL team so far too. But here we look at the God of War voice actors bringing the story to life on the PlayStation 4. I’m a big fan of the God of War series and I’ve enjoyed every moment so far with our MGL God of War Review here. But given the story depth this time I thought why not have a look at this awesome cast and the characters? Find out who stands out from God of War below with our look at the key performances, plus a full list of the cast at the end. (Minor) Spoilers Alert! Don’t worry too much about huge story spoilers if you have not played or completed the game. All of the characters here are found in the very early stages of the game with nothing significant revealed. He’s a man that needs little introduction, Kratos is one of the big PlayStation protagonists and one we have grown to love. We love him so much we can completely forgive Ascension! Actually, it’s not that bad but it’s no God of War 3 that’s for sure. Everyone screamed at E3 when he first came out of the shadows years ago now. He’s finally here and we are loving it. But, he’s not the Ghost of Sparta any more. Kratos lives like a man in another land until the game begins and things change. Kratos is now an older, seemingly calmer person after his events with the gods of Olympus. But with his wife passing it leaves him and Atreus (AKA: Boy) to follow her last wish. Scattering her ashes on the highest peak in all of the realms. Now, this sounds simple enough but he’s not exactly close with his son. Kratos, much like with his last family, seems not to be around the majority of the time. 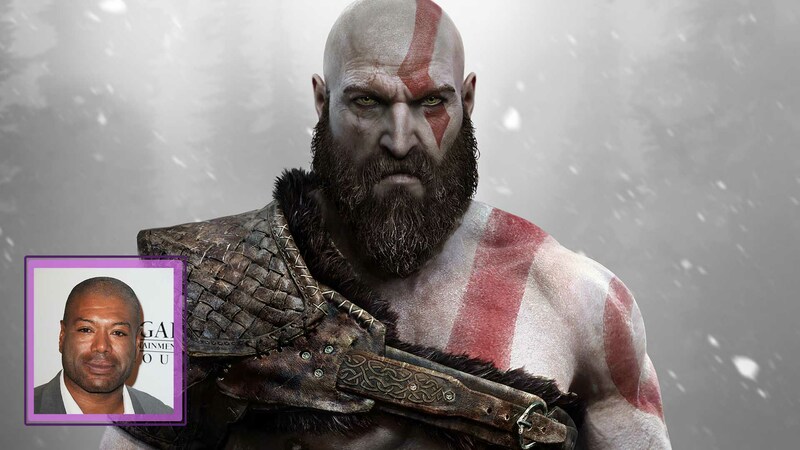 Here they embark on the journey where Kratos’s life as a god, a man and a father are all tested equally. Personally, I really enjoyed the change in character. Kratos was a fantastic anti-hero in many ways in the original games. But here, it suits him far more to see him being more human. Even if it’s really hard for him to do. This all works with the outstanding performance of Christopher Judge. Indeed, Chris Judge is the man to take on this character and does a wonderful job. The deepness and booming nature of his voice feels borderline godlike in itself as he delivers lines. Coming from the excellent Stargate SG1 as Teal’c, he brought a very rich tone to the character of Kratos. The power comes through in every sentence he delivers. Most of them involve the word “Boy” as he directs his son around. His performance throughout seems like on the surface he’s very up-tight, especially in his relationship with Atreus. But as things move through the story the emotion of a character who was always angry and bloodthirsty changes to that of a caring father. One that will do anything for his son, and it shows in some amazing scenes. Chris Judge does a wonderful portrayal of Kratos and one I’d really like to see more of in future releases. I think it’s a safe bet both will happen. New to the series we get to grips with Kratos’ Son early into the game. It’s very clear his main influence has been his mother and he doesn’t know anything much about his father at all. This is no wonder. Kratos’ past isn’t exactly something talk about casually over dinner. 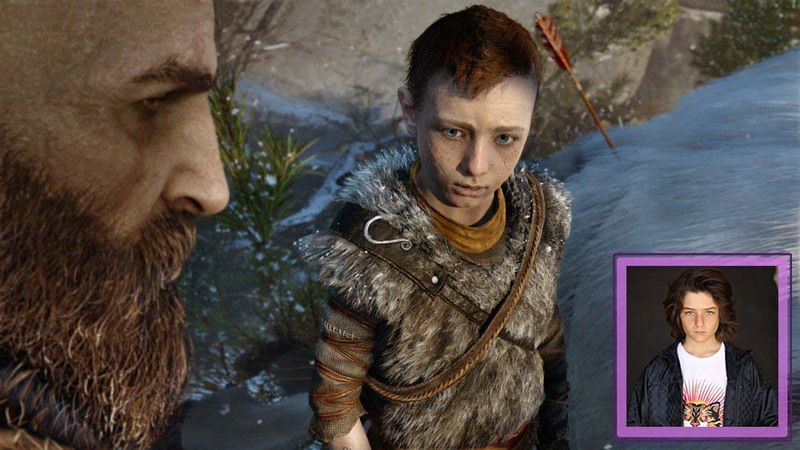 So Atreus is hoping to bond with his father on the journey, and find out more about his father and himself. But his combat and hunting skill isn’t quite there yet. Plus it’s made clear he had been sick for some time beforehand, what exactly caused it is not made clear right away however. One thing is made clear early on, Atreus is an incredibly intelligent boy. He’s key to translating the old languages as you find lore and shrines around Midgard. His development through the story also makes for some of the best moments in the game. Played exceptionally well by Sunny Suljic. For a young man we’ve seen Sunny in Criminal Minds episodes and a few films including The Killing of a Sacred Deer. After this excellent performance in such a big game, on his video game debut no less, I think his voice is going to be called upon a few more times. He really does play the role well. First he comes across somewhat nervous and almost overcompensating for it all by rushing in. Later his character and his relationship really grows and develops with the story. Due to the events in the journey you take, there is a section where things get somewhat strained between him and Kratos that was quite hard to listen to. It was quality acting on both sides and he’s one to watch for in more games and other media for sure. In the early stages of the game, hunting with your son you come up against a few enemies. But soon you are confronted by a man at your home who is rather strange. Soon he picks a fight with Kratos… yes, not the best idea anyone ever had. Particularly someone who looks like a stoned hipster. But it soon turns out, while he’s considerably smaller in comparison to Kratos, he’s not to be messed with. The boss fight that follows is one of the best i’ve experienced in gaming. Everything about the way it was constructed and delivered really set the tone for the game early on. Trees go flying everywhere and with land beneath you begins to crack open and Kratos needs all his strength to make it through. The aftermath of the battle follows the story for some time too, plus the mystery of who he is becomes integral to your journey. In all the action here, one thing really stands out about the confrontation: the performance of Jeremy Davies. He really does make The Stranger have a really high impact. It’s not exaggeration to say Jeremy Davies is Jesus! As a fan of the American Gods series (and Neil Gaiman novel) it was very cool to see Jeremy, who literally plays Jesus, as part of the God of War team. He really does play “The Stranger” well and make a big impact in the scene at the start of the game. As an actor who is very experienced in TV and movies with Lost and Sleepy Hollow some great examples. I think the full motion and performance capture really suited him in this role. Throughout his introduction, despite being small in comparison to bosses of Kratos’ past. He really makes big on his performance. Another of the main supporting cast you meet early on is “The Witch”. Now, it’s hard to go into too much depth with the character as she is brought into the game after the introduction. I did promise to keep spoilers to a minimum! She’s an interesting one however, her personality is kind and reclusive but not all of it is her choice. You soon get the impression there’s more than meets the eye with her, although you get the feeling early on her motives are what she perceives as “good”. The ever cautious Kratos is naturally unsure of her, but soon finds her to be someone he really has-to to rely on. Given her importance in the game’s plot, it’s a performance that also stands out with Danielle Bisutti really delivering impressive in the role. As someone that gets uncomfortable watching horror at the Scary Movie level, I’ve not quite appreciated how well Danielle has done in the Insidious movies personally. She’s also been involved with a number of great TV series. Much like Jeremy Davies, the full motion capture of her performance really suits her movie and TV acting style. She’s particularly great when she has some tense conversations with Kratos about his past and what’s going on around the 9 realms. 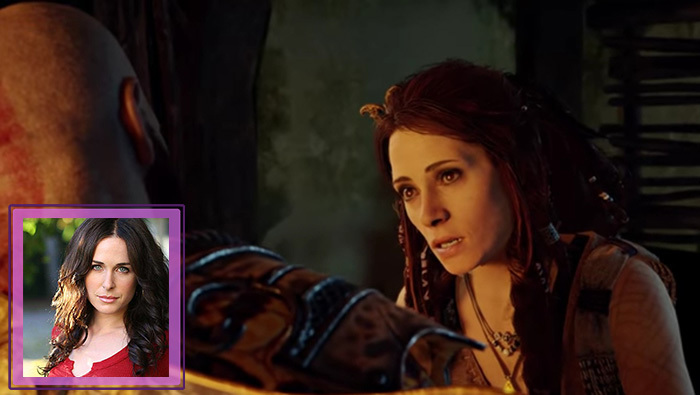 She really does play a great role in the story of God of War, and throws in a few surprises too. The fact that Kratos is more reserved and lacks more human expressions of emotion, her ability to come across as a softer, more “feeling” character really lifted the game early on. Plus this only gets better as you progress. Normally we only focus these Voice Artists Spotlight pieces on the protagonists and antagonists of the games story. But that would miss some outstanding performances by supporting cast members in God of War. The game actually doesn’t involve too many other people other characters overall. But Mimir and the two dwarves, Brokk and Sindri really do play a great role throughout your adventure. And the actors behind them are brilliant. Gaming voice acting legend Alastair Duncan (Celebrimbor in Shadow of Mordor/War) plays Mimir here and brings some excellent storytelling as an “all knowing” type character. Robert Craighead (Dead Rising & Futureman) and Adam Harrington (Battlefield Hardline, L.A. Noire) are outstanding supporting characters in Brokk and Sindri. I genuinely laughed allowed at the end of the game as all of them came together for a great moment. There we go, those are the voice acting leads that really stand out here gamers. All that tallent and both Nolan North and Troy Baker don’t get a mention! They are in there though all, look out for them. Who’s performance in God of War are you looking forward to the most? Let me know what you think in the Disqus or Facebook Comments below. There is more gamers, to save you searching around here is the list of cast as revealed at the time of publishing in the table below. Spoiler Warning! I have been careful above with character’s names, by looking at the grid you will see potential character spoilers and appearances you might want to experience first hand. Found this interesting, even a little useful? 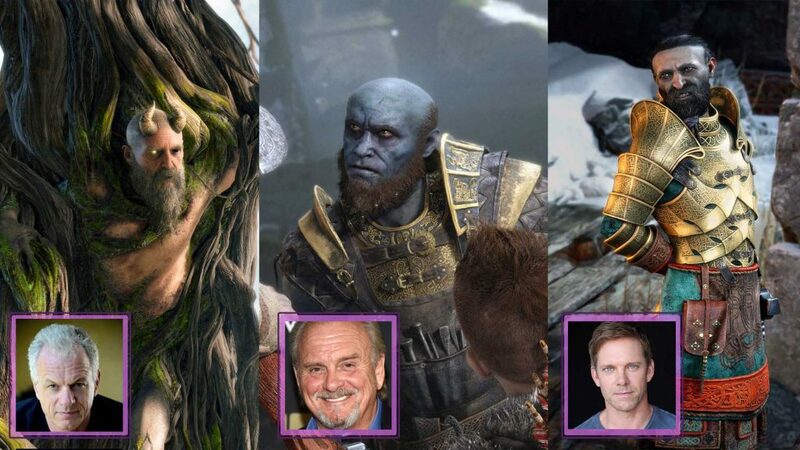 Well, why not Share This with other gamers that might be interested in the God of War voice actors.